What do Canada, Brazil, and Germany have in common? This year, it is The Rotary Club of Winnipeg West, through their participation in Rotary International’s Youth Exchange Program, and sponsorship of students leaving and arriving in Winnipeg. Winnipeg West rejoins numerous clubs around the world and several across District 5550 as they enable year-long programs for young people spending life in a far-off country, learning a new language and immersing themselves in a different culture, through high school and life in host families. The program has been running around the world for many years and has enabled enriching experiences to thousands of young people, connecting both with their new hosts and one another through planned Rotary activities. Approached more than a year ago, Winnipeg West club accepted Kelvin High School grade 12 student Tannis as an outgoing student on the program, sponsoring both her experience, and accepting a student to arrive here in return. Undergoing both an assessment and training period, Tannis prepared for the year away, although she had no idea where she might end up. Her choices focused on three European countries, so when she received the call telling her she was going to spend a year in Brazil, she was completely shocked. As the news slowly sunk in, she was very excited and embraced the challenge ahead. The Rotary Youth Exchange Program (YEP) guided her over several months through the extensive paperwork and application for a foreign student visa. Tannis, 17, left near at the end of July, so has now spent more than a month in Brazil. The city is called Assis, about 100,000 people, in the large state of Sao Paulo. Her Portuguese language skills are growing each day, and she has been attending a local public high school, that starts their day at 7 AM! There are quite a few YEP students in her area, so they see one another frequently. Her life is dramatically different from that in Canada, and each day brings new learning, connections, and friendships. 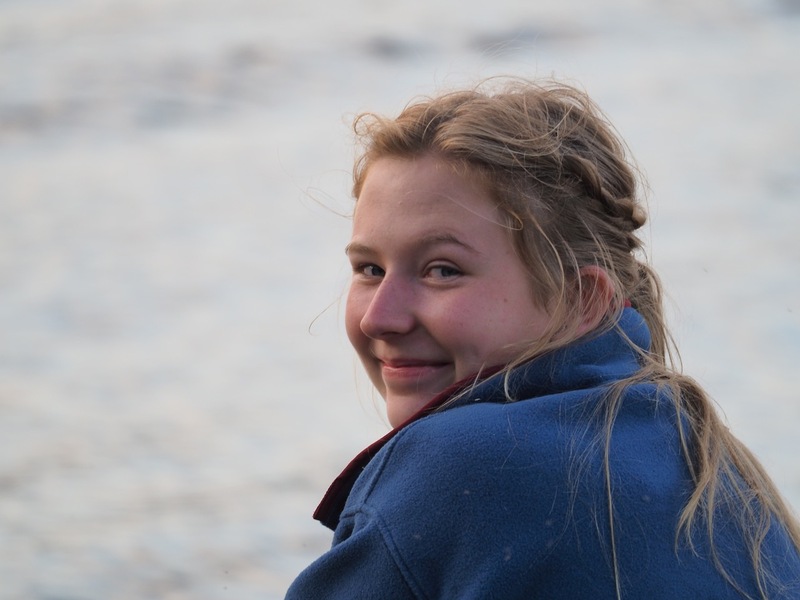 The big thing on the horizon of Tannis and her fellow YEP students is a large trip experiencing almost three weeks including Brasilia, the north east, and the Amazon! Once their student has departed, the responsibilities of the host club are far from over! Indeed, in most respects they are just beginning. The exchange means a student arrives here for an entire school year, usually from a completely different area than the outbound student has gone. The district YEP organizers work to match up inbound students with host clubs, and this year Winnipeg West welcomed Merit from Stuhr, near Bremen, in Germany. Merit is also 17 years old, and part way through her high school education. She was coached and prepared by her Rotary Club Syke 1850, and ready for a year of new experiences. Back in Germany, Merit enjoys school, plays the flute and is on a competitive team playing a game called netball. She has traveled with her family to many places, and has studied English at school. With the cooperation of the Winnipeg School Division under board chair Mark Wasyliw, the Rotary program was permitted to enroll Merit in Kelvin High School for the year. The YEP program had languished in Winnipeg for a number of years after local clubs came up against challenges with new rules with some school divisions. Two years ago the ice was broken, and Rotary Club Charleswood hosted Karl from Norway. Karl also attended Kelvin High School and had a very successful time. By the end of his year, Karl was a well-known face amongst the grade 12 students, excelled in his classes, and mastered the game of Ultimate. 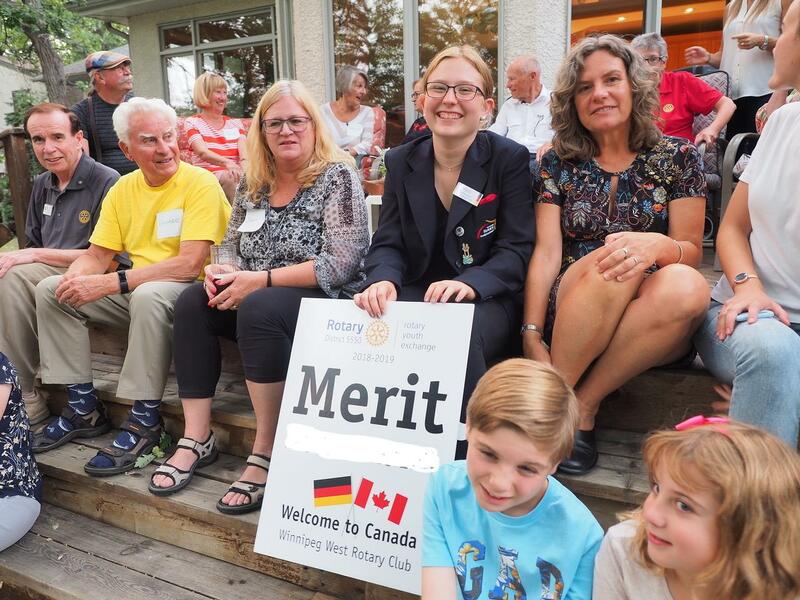 Less than a month ago, members of The Rotary Club of Winnipeg West greeted Merit as she arrived at the airport August 17, and hosted a reception on her behalf at the home of YEP club Chairman and past president Jack. Merit then stayed a few days with Marg , who is sharing the counsellor position along with Rotarian Ola. Merit being welcomed to Winnipeg by The Rotary Club of Winnipeg West and Liz Hydesmith (right) host mom. Merit will spend the first part of her year with the Hydesmith family, slipping in where Tannis left for Brazil. The Hydesmiths are supporters of the program, having met in Germany themselves while on their exchange years in Germany, back in the 1980s. Liz was sponsored by the Australian Rotary Club Raymond Terrace, District 967, and Brian from Brandon, in (then) District 555. Their daughter Eliza spent a year in Belgium, sent by RC Charleswood while they hosted the student from Norway. 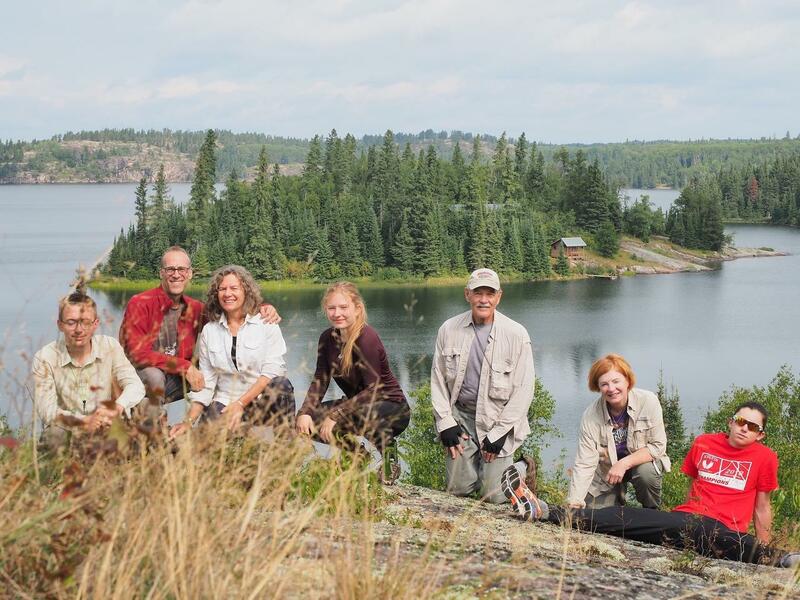 The first adventure in this family for Merit was a “quintessential Canadian" canoe trip the Hydesmiths do often, to Nature Manitoba’s cabin on Mantario Lake (www.mantariocabin.ca) in Whiteshell Provincial Park's wilderness zone. After the five day trip, Merit had only a few days to prepare for the start of school! She is enrolled in Grade 12, with a wide variety of subjects. She can walk to school each day, and is getting used to her new neighbourhood and daily life. She has already visited several Winnipeg sights from Assiniboine Park to the Forks and beyond. The year ahead will hold many new experiences. With the first short week of school behind her, Merit is learning a great deal and improving her language skills noticeably. As the only Rotary YEP student in all of Winnipeg, Merit is one of only 16 scattered across the vast district 5550, many in rural towns. Winnipeg Rotary clubs hope that the experience of Winnipeg West this year and the Charleswood club that hosted Karl Biehl from Norway (also in the Hydesmith family) two years ago will restart the momentum of the YEP in the city for the future. Merit will begin attending some of the Winnipeg West meetings once school has settled in and she knows her way around. Her counsellors and the club are kept in the loop as the small pieces of the puzzle of daily life are put together to ensure she feels confident with the experiences ahead. The first gathering of the inbound YEP students will be at the end of this month, at Neepawa. This will be the first time these students, who are spread through the district from Sioux Lookout to western Saskatchewan, to meet one another. The immediate connections these students form with one another is inspiring. Other highlights planned through the year for the YEP students include a trip to Thompson and Churchill at the end of October and a winter spots day in Melfort Saskatchewan early in the new year. In past years there was an optional bus tour to the mountains in the spring, a and get-together with the outbound students in Russell. Their final group gathering at a camp near Flin Flon before they return to their countries across the world. The Rotary YEP students in our district return to their families, school, lives, and futures deeply enriched through the good will and friendships with one another, their host clubs, and deep connections with new families and friends formed through this extraordinary experience provided through the long-running YEP program of Rotary International. These lucky students in turn spread the messages of international understanding, peace, diversity, friendship, and good will with everyone they meet. This is meaningful contribution to the future generations and something Rotary can be proud of making a difference.